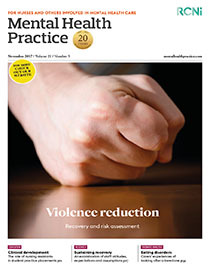 The assessment and management of the risk of violence in mental health services is an essential component of nursing practice. The purpose of this has been to deliver defensible practice in a risk-averse society, instead of delivering evidence-based nursing care. This in conflict with a nursing focus on promoting recovery-based services. This article will describe how the incorporation of protective factors into the assessment of risk can bridge the gap between recovery and risk of violence assessment. Attending to protective factors can encourage a therapeutic rapport between the patient and practitioner. By instilling a sense of hope into collaborative working, areas of potential growth can be developed without constantly revisiting weaknesses and historic behaviours. One practical way for nurses to build protective factors into their assessment of risk is when developing care plans or planning for a care programme approach.